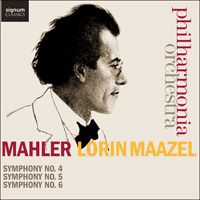 Lorin Maazel and the Philharmonia Orchestra perform Mahler’s Fourth, Fifth and Sixth Symphonies. 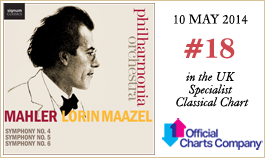 This is the second set in a series that encompasses Mahler’s Nine Symphonies, featuring live orchestral recordings from London’s Royal Festival Hall of Maazel and the Philharmonia’s much-lauded Mahler Cycle. Many of the critics at the première linked the symphony’s modernisms to Mahler’s affiliation with Vienna. Even though the spirit of the Fourth is rooted in his Wunderhorn songs there is some truth in this. Mahler had moved to Vienna to take up his role as Director of the Court Opera in 1897. The burden of work brought on by the new post meant that he started no major project until the summer of 1899, which he spent in Bad Aussee. Rain, cold and ‘ghastly health-resort music’ distracted him, but at the end of July Mahler managed to break his creative block and drafted half of the first three movements of his Fourth Symphony before being forced to pack up his sketches and return to his duties in Vienna. Though his exposure to modernist circles was relatively limited at this time, the Fourth’s change of mood and style places it closer to the concerns of Viennese modernism than his earlier works. Above all, this is found in the degree of self-consciousness that the Fourth exhibits about its own musical language. The first movement, for example, plays with the historical legacy of Schubert, Mozart and Haydn—fondly, to be sure, but at the same time accentuating the gap between new and old Vienna. The first movement announces its childlike tone with its very first distinctive sound—the sleigh bells, referred to by Adorno. They give way to what seems like it might be the beginning of a classical symphony—a Haydnesque theme in the strings, followed by a chugging quaver accompaniment in the woodwind. But little details betray that this is not the real thing. The violin upbeat is held back in tempo, and has a gently sentimental glissando, and the answering phrase in the basses is cut off by the horn. And so it goes on—not as a parody, so much as an affectionate play with the familiar manners of the classical style. One moment the musical energy is held up by languorous diversions, the next it lurches forward in a series of stops and starts. Only the development section seems to threaten something more serious, but in the context of this children’s tale, the trumpet that calls the orchestra to order is apt to sound like a toy one. Towards the end of the movement, Mahler’s musical story seems to have strayed into a more celestial realm, before the spell is broken by a thoroughly boisterous ending. The second movement is a Scherzo that draws on familiar folk-like elements but presents them in such a way that they become discomforting, or ‘uncanny’ (to use Mahler’s word). Nothing here quite fits as it should in this odd mix of elements that are, rhythmically and harmonically, at cross-purposes. Mahler suggested one might think of this movement as ‘Freud Hain strikes up’, referencing a rather disturbing figure of German fairytales whose music, like the Pied Piper’s, lures children to their deaths. The spectral violinist is evoked in the solo role given to the leader, who uses a violin with strings retuned a tone higher to give it a harsher sound. Mahler instructs that it should be played ‘Wie eine Fidel’ (like a peasant fiddle). Outwardly, the movement sounds like a busy divertimento with a constant exchange of material between different solo instruments, but the effect is skewed by the constant misaligning of its elements. It is endlessly characterful, at times giving way to a slower and more sentimental dance, and occasionally broadening out to something more spacious and peaceful, but everything is remixed by the continual turning of Mahler’s musical kaleidoscope. The slow third movement begins in a completely different world. After the acerbic woodwind tones of the Scherzo, Mahler begins with the lower strings alone. Only gradually does he add the violins, subdividing each section to achieve a wonderfully spatial choral effect, as if the music were expanding outwards and upwards from within. This is one of Mahler’s most beautiful musical landscapes, evoking a quality of deep repose that links it with some of the Rückert-Lieder. Mahler referred to it as ‘a transfigured cradle song’, relating it at various times to the depiction of a sleeping figure on an old tombstone, the smile of St Ursula, and a childhood memory of his own mother’s face. Constructed as a set of double variations, it alternates between the self-sufficient beauty of nature and the melancholy that beauty induces in the individual—the oboe melody is marked ‘klagend’ (lamenting). A series of accelerating variations seems to evoke the bustle of life from the Scherzo before coming to a crashing halt. In the stillness that follows, the orchestra traces a slow ascent through a series of plateaux, each one higher and brighter than the last. Just as this luminous atmosphere is about to fade, Mahler unleashes a wild jangling and ringing of the whole orchestra with horn fanfares echoing out across the distance. Once more the violins ascend heavenwards, their arching lines coupled with some heartstopping modulations. Music rarely evokes such a powerful sense of leaving behind one’s earthly body. Which leaves Mahler an apparently impossible task for his finale. How does one represent the unrepresentable? If the end of the slow movement achieves a kind of limit, beyond which one cannot go, how can Mahler follow it? How can he deliver the ‘heaven’ that the end of the previous movement has promised? The answer is not only the key to the whole symphony, but was also its starting point. The sleighbells and fairytale tone of the first movement return with the simple folk tone of ‘Das himmlische Leben’, the song that forms the finale. Mahler noted in the score that the vocal part should be ‘sung with childlike and serene expression, absolutely without parody’, anticipating that his intentions would be misunderstood. The song seems cleverly to recoup motifs and sonorities from the earlier movements, though in fact, it was written first, some seven years before the others were begun. It tells, with great relish, of all the pleasures to be found in heaven (mostly edible ones, given this is a child’s view). There are dark moments to be sure, ‘butcher Herod’ is lurking and ‘St Luke does slaughter the ox’, but otherwise the picture of joy and plenty is created by a surfeit of good things, piled up in the highly visual language of the folk text. As it begins to fade towards its close, the soprano sings ‘Kein Musik ist ja nicht auf Erden, die unsrer verglichen kann werden’ (‘No music is anywhere on earth that can be compared with ours’). And yet we hear it. From the memory of an idealised childhood, Mahler sounds out a music not of this world. Between the completion of his Fourth Symphony, with its ending in a childlike vision of heaven, and his Fifth, which begins with some of his most unremittingly tragic music, Mahler suffered a major crisis in his health from which, reportedly, he nearly died. In February 1901 he had a serious haemorrhage that necessitated an operation and a prolonged period of convalescence. As an immediate result he considerably reduced his huge workload, cutting by half the number of opera performances he conducted (from around 100 to a still substantial 50 a year) and giving up his conducting of the Vienna Philharmonic Orchestra. While convalescing, Mahler took the opportunity to study the music of JS Bach. His delight in the contrapuntal discipline within which he immersed himself is increasingly obvious in his music from this time. This move towards more objective and constructive concerns might seem to be marked by Mahler’s Fifth Symphony, with its apparent distancing from the programmatic outlines, words and human voices employed in his earlier symphonies. But as the Fifth makes abundantly clear, Mahler’s retreat from the perils of programmes was absolutely not allied to any reduction of emotional temperature. Indeed, the Fifth is shocking for the intensity of its emotional polarity, from the stark brutality of its opening Funeral March (in C sharp minor) to the joyous affirmation of the chorale with which its Finale ends (in D major). The Symphony falls into three parts that, taken together, trace an astonishing ascent from the negativity of the opening two movements (Part I) written in the summer of 1901, through the exuberant dance of the central Scherzo (Part II), to the passionate and uplifting final two movements of Part III, written in the summer of 1902. In the intervening winter, Mahler met Alma Schindler and, two months later, married her. Their first daughter, Maria, was born on 3 November 1902. The first movement of the Fifth Symphony is constructed in terms of an unremitting opposition. The force of Mahler’s orchestra, deployed to sound like a vast military band, presents death as a cold, implacable march, with echoes of Revelge and Der Tamboursg’sell. The voice of mourning, by comparison, limps wearily and without hope. Nothing further could be imagined from the buoyant and life-affirming allegro of a classical symphony, but Mahler’s Vienna was a different place and a different time to that of Haydn or Mozart. The Fifth sounds less like a personal ‘funeral rite’ (as his symphonic poem Todtenfeier might have been conceived) than a collective processional for his age. It is not hard to imagine this movement as the soundtrack for the grand imperial funerals in the years before the end of the First World War, or indeed for the demise of the Habsburg Empire itself. If the first movement pits a broken, lamenting spirit against the tragic tone of the Funeral March, the second protests with music of unprecedented vehemence. Mahler treats the orchestra like an expressionist painter treats a canvas, breaking up line and surface with vivid, angry gestures and wild colours. This is an extreme form of symphonic battle music, but not a battle against some external foe, as narrated in a work like Richard Strauss’s Ein Heldenleben; this is the battle of a painfully divided self. At one point that self seems utterly defeated, as the energy of the music collapses to leave just the faint murmur of a roll on the timpani. A single unaccompanied line in the cellos suggests a state of complete emptiness, without direction or strength. On the other hand, there are times when Mahler incites his players to such violent intensity of tone that the orchestra boils like an angry sea. But in the face of this impossible storm, Mahler dares to signal a moment of unhoped for and unimaginable breakthrough. The brass arrival at a chorale theme in D major is one of the most heart-breaking statements of hope in the history of music—heart-breaking because it changes the world utterly, but then is snatched away moments later. For a few brief seconds, it feels utterly true—and then vanishes. With a scurry, the battle returns, but the movement ends with a draining away of its energy. Odd whistles and squeaks, accompanied by disembodied rhythmic repetitions suggest an old steam engine running down rather than any kind of heroic ending. The Scherzo is the pivot on which the whole symphony turns. It is a life-affirming collective dance, led by a solo horn like the caller in the dance. It may well relate to the movement Mahler planned in an earlier sketch titled Die Welt ohne Schwere—the world without gravity. ‘It is man in the full light of day, at the zenith of life’, Mahler described it, in which ‘every note is of fullest liveliness and everything resolves in a whirling dance.’ In place of the antagonistic counterpoint of the previous movement, the rich proliferation of lines and bright colours suggest a joyful crowd scene. This affirmative dance of life sometimes slows to become a more sentimental and wistful waltz, and on two occasions the space of the entire scene opens out to a quite different perspective. Echoing horns silence the bustle of the world, which gives way to the space and silence of the mountains, framing a passage of quiet reflection. The heartfelt dialogue of horn and cello is thus heard outside the time frame of the dance. The slow waltz returns tentatively, in a pizzicato version, as if half remembered (Mahler’s music has an astonishing range of past tenses) before the solo horn calls the dancers back into the present. From a famously tremulous beginning, the Adagietto moves from utter gentleness to searing intensity and back, in just over one hundred bars. The Dutch conductor Willem Mengelberg always claimed that the Adagietto was sent to Alma by Mahler as a declaration of love. It is unclear whether this was soon after they met, or the following summer, after they were married. Either way, if this is Mahler’s love song it is perhaps one to the ideal of the feminine love he longed for and that he hoped to find in Alma. For her, it might also have given notice of what sort of man she was dealing with. There is certainly tenderness here, and passionate intensity, but of a deeply searching and demanding kind. Many listeners have heard a similarity between this movement and Mahler’s great song of inward retreat, Ich bin der Welt abhanden gekommen whose content is certainly not incompatible with seeing Alma as a kind of haven. Whatever its origins, what is clear is that the Adagietto presents a song without words, sung by a single ‘singer’ (albeit divided into multiple strands) accompanied on the harp. The Rondo-Finale begins with an odd exchange. A call on the horn is answered by a little phrase on the bassoon (a quotation from Mahler’s earlier Wunderhorn song, Lob des hohen Verstandes, in which a donkey, as critic, awards the prize in a singing competition to the cuckoo instead of the nightingale). The bassoon is followed by a closing phrase in the oboe (that turns out to be nothing less than the triumphant theme with which the movement will close). Is this a last fond farewell to the world of the Wunderhorn, or Mahler letting the critics know what he thinks of them? Whichever, it sets the buoyant tone that carries the symphony to its conclusion. Mahler’s study of Bach is much in evidence in the energetic passages of counterpoint, including an odd grazioso revisiting of the theme of the Adagietto. There are faint echoes of the D major chorale from the second movement, promising a return of its affirmation, before the busy contrapuntal writing is restored. Mahler presents a bewildering succession of different sections in this Rondo, separated by tangential changes of direction and sudden restarts, but somehow, like the consummate storyteller/sorcerer he was, he brings all these elements back together and binds them into a whole. The sheer richness of this is overwhelming at times before being rounded off by the re-arrival of the triumphant D major chorale, anticipated way back in the second movement. Such is the long-range view of Mahler’s great musical novels. The Sixth is an extraordinary and highly individual symphony even in Mahler’s output of extraordinary and individual works. It is often cited as his most classical symphony in that it returns to a four-movement plan and uses neither solo nor choral voices. Like its neighbours, the Fifth and Seventh, the Sixth Symphony thus seems to return to a more abstract symphonic tradition. But what is said less often, is that it does so not to confirm that tradition, but to wrestle with it. It takes up the legacy of the symphony since Beethoven, of heroic struggle towards some eventual breakthrough and affirmation, but presents the unthinkable—that this struggle might fail, that the symphonic hero might actually be defeated. The Sixth Symphony sometimes carries the title, 'The Tragic'. Mahler proposed it and then withdrew it, perhaps for the same reason that he withdrew the final and fatal hammer blow from the last movement, because he was, by nature, a superstitious man. But the original title neatly draws attention to the model that this work subverts, Beethoven’s 'Eroica' symphony. The hero lives on in Mahler’s music, but finds himself in a very different world to Beethoven’s. Perhaps the epithet ‘Tragic’ might be understood in the terms that Friedrich Nietzsche set out in The Birth of Tragedy (1872). The hero of ancient Greek tragedy, Nietzsche argued, must necessarily be destroyed, because tragedy is an enactment of the metaphysical truth that individual forms (represented by the hero) must inevitably perish and be reclaimed by the totality (represented by the chorus). This may be a more helpful way of thinking about the peculiar nature of the Sixth than the link made repeatedly between the three hammer blows of the Finale and the three blows of fate Mahler was to suffer in the summer of 1907, some three years after he completed the symphony—that is to say, the death of his daughter Maria from scarlet fever, the subsequent diagnosis of his own fatal heart condition and his forced resignation from the Vienna Hofoper. There were, in any case, five hammer blows originally planned for the Finale, and Mahler scrubbed out three of them—the third as part of a revision in 1906 made while he was writing the hugely affirmative Eighth Symphony. And though it is true that in the summer of 1904, in which he wrote the uncompromising Finale to the Sixth, he also wrote the two songs with which he completed his Kindertotenlieder (Songs on the Death of Children), he also wrote the two magical movements that were to become the Nachtmusiken of the Seventh Symphony. The point is, there is no explanation for the unprecedented negativity of the Sixth Symphony to be found in the events of Mahler’s life during 1903 and 1904. These were years of great professional success and personal happiness. His production of Wagner’s Tristan und Isolde at the Hofoper in 1903 (with designs by Alfred Roller) was universally praised; performances of his own music met with rapturous reception in Amsterdam, Basel and further afield. His summers were spent at his imposing new villa at Maiernigg, beautifully situated on the shores of the Wörthersee in Carinthia. In 1904, as he arrived there to begin his holiday, Alma stayed in Vienna to give birth to their second daughter, Anna. It is true that, alone and frustrated by bad weather and a compositional block, Mahler was impatient to make progress. He was also annoyed by the local people, disturbed by the noise of tourists and animals, and generally in a prickly mood. But none of that explains the ending of his Sixth Symphony. Nor should it. Art is hardly symmetrical with the life of artists, even when they insist it is. The Sixth is certainly a work of ‘extreme violence’, as Mahler biographer Henry-Louis de La Grange suggests, and one that refuses to allow its uncompromising logic to be deflected. The wind and brass are often instructed to play with a harsh tone, melodic lines are painfully stretched across wide, compound intervals and Mahler’s acerbic contrapuntal textures allow for little warmth except in the Andante. Much of the music is overdetermined, in its exaggerated and unrelenting march rhythms and in the frequent doublings of its orchestration. Uniquely among Mahler’s symphonies, the Sixth ends neither in affirmation nor in transfigured withdrawal. But it is not without yearning for transfiguration; indeed, it is precisely the intensity of that yearning that produces the violent conflict of the Finale. The sound of cowbells must have seemed an unlikely musical symbol for the heavenly in 1906, yet in Mahler’s hands that is how this unusual sonority, imported into the orchestra for the first time, comes to function. Mahler insisted his use of them was symbolic rather than literally pictorial, but one is surely related to the other. Anyone who has walked in the Alps, and stood high up on a mountain looking out over the valley below, will recognise at once the unique sound of the clanking of cowbells across the distance. The sound becomes inseparable from the experience of the bright, clean air of the high mountains. For Mahler, as for Webern after him, this world was not so much a cipher of the heavenly, but a glimpse of its reality. The otherworldly sound of these primitive bells, so foreign to the refined tone of the modern orchestra, thus comes to stand as a mnemonic for paradise, glimpsed from the high edge of the earth. Their gentle but unruly sound breaks into three of the symphony’s four movements, but only momentarily. The unremitting logic of the Sixth refuses this intrusion and its motto theme of major to minor, open to closed, allows for no reversal. There is no breakthrough, no redemption and no transfiguration. The first movement is a march and a decidedly grim one at that. For a start, the music seems to get stuck on its tramping bass line, as if the whole orchestra is marching on the spot. The insistence of this repeated rhythm is combined with melodic lines that are stretched over wide intervals and often heavily doubled to create a hard-edged sound. The uncompromising and forceful opening eventually subsides, but is rounded off by a startling motto theme—three trumpets blaring out a major triad that then falls mournfully into a minor one, over a rhythm punched out in the timpani. A mysterious chorale-like passage in the woodwind provides a transition to the second theme in which, Mahler apparently told his wife Alma, he had tried to capture something of her. Certainly, it is passionate, intense and mercurial, if not theatrically so. The progression of the movement is shaped around the opposition of these two ideas, in which the rather brutal energy of the march seems to get the upper hand, but this is interrupted by an extraordinary and unexpected detour—an episode inter-cut into the main narrative like a dream sequence in a film. The far-off sound of cowbells and the unworldly tones of the orchestra mark this out as one of Mahler’s evocations of nature—a distant landscape glimpsed momentarily before being violently interrupted by the unprepared return of the march material. Only at the very end of the movement is there a sense of breakthrough, as A minor gives way to A major in an affirmative ending marked by all eight horns sounding out a lively return of the Alma theme. The Scherzo is generally played second though there remains disagreement on the question. This was the sequence in the first edition of the score, but at the première in Essen in 1906, Mahler decided to perform the Andante before the Scherzo, an alteration reflected in the second edition of the score. The decision changes the nature of the work to some extent. Heard second, the Scherzo immediately restores the key of A minor, reversing the blaze of the major key heard at the end of the previous movement (a kind of macro-version of the motto theme itself). The Scherzo also brings back the insistent repeated bass notes of the first movement, but the march rhythm is here displaced by a triple metre and constant disruptions by off-beat accents. As a result of the doubling of instruments and Mahler’s use of extreme registers, the tone is often deliberately harsh. But, as in the first movement, the principal narrative is intercut with an unprepared Trio episode, a strangely rustic moment which Mahler marks altväterisch (old-fashioned). Where the main Scherzo material is unrelenting in its insistent push forward, this episode seems to have all the time in the world. Such changes of mood and musical voice run through the whole movement, disorientating the listener all the way to the last bars, which simply wind down rather than end. The Andante is one of Mahler’s most lyrical slow movements, beginning as an instrumental ‘song without words’ like the Adagietto of the Fifth Symphony. In the context of the Sixth Symphony as a whole it takes on the character of a reminiscence, a sustained vision of an idyllic landscape but framed between the threatening dark cliffs of the other movements. The principal melody exploits Mahler’s technique of dividing the line between the first and second violin sections, creating a sense of one melodic wave riding over the other. The nature of this movement as an idyll is confirmed by the shift from its key of E flat major to Mahler’s ‘heavenly key’ of E major, accompanied by the return of cowbells (this time heard as if close by, not in the distance as they were in the first movement). Twice the music breaks through into E major, but only momentarily. With the fall back to the main key the movement seems to confirm its own air of unreality and its status as a wistful memory, out of time and curiously distant from the rest of the work. The peacefulness of its ending acts as a foil to the eruption with which the Finale begins. Where the landscape of the previous movement was idyllic, the one into which the listener is suddenly thrown in the Finale is utterly mysterious. As the operatic smoke clears, a violent restatement of the motto theme returns us to the world of the first movement and then falls away to nothingness. What emerges from the silence is the lone voice of a tuba. Disembodied fragments of a march theme appear, but without any energy to galvanise them. Gradually, the elements are assembled into something forward moving but each time it gets going it seems to be ripped up and has to start again. Battle ensues on a massive scale. Just as victory seems to be in sight and a breakthrough might be envisaged, the music is physically and brutally interrupted by a terrifying thud. This is the first of Mahler’s ‘hammer blows’. In the score he directed that it should be delivered ‘like an axe blow’. In the heroic narrative of the symphonic finale, the hero should pick himself up from this appalling set back and go on to win the day, just as he does in the First Symphony. Mahler’s hero does indeed pick himself up but only to be struck down for a second time. Once more, he rises to his feet. At the very moment he seems to be about to win through he is utterly felled by a third blow from which he does not recover. A funereal cortège of four trombones accompanies the tuba to the end. A final, horrifying scream of the motto rings out, fades and is cut off by a single pizzicato in the strings, like a clod of earth hitting the lid of a coffin.